Posted on March 19, 2015 This might be outdated! I want to ship specific products for free while some others will have shipping costs, but when a product having free shipping is in cart with another product that has shipping costs, free shipping isn’t available at all, what to do? You need to create a “Free” shipping class. You can create as many other shipping classes as ou want. 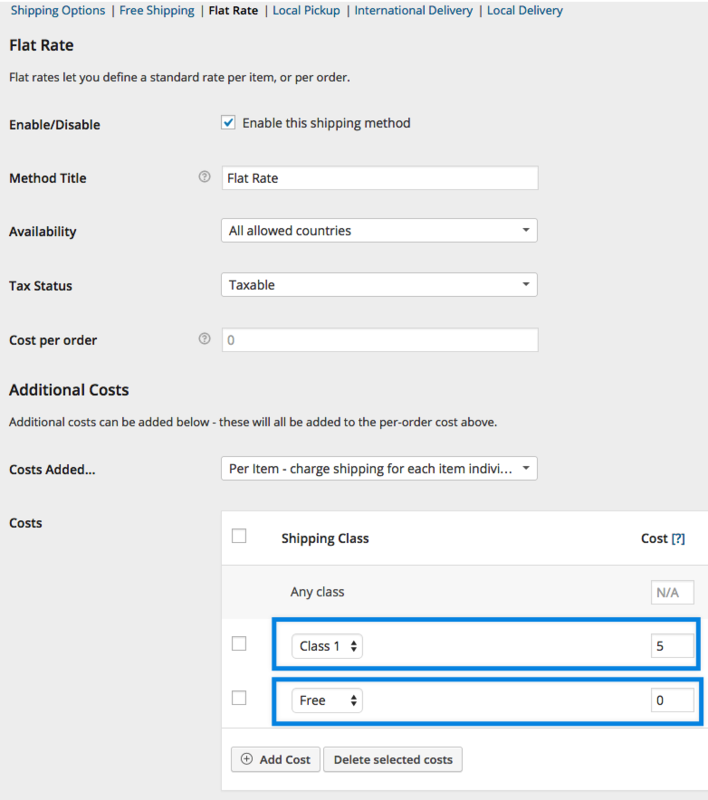 Make sure that you setup a cost equal to zero for the free shipping class. That’s it! I hope that will save you some headaches! If you enjoyed this post, make sure you share it on Twitter! Hi, after created my shipping classes, I went to the shipping setting ‘flat rate’ and add cost but there is no dropdown. May I know what might be possible wrong? I’m using APG shipping. I have free shipping setup in woocommerce as available for orders over $100. I setup 2 shipping classes “allow free” and “paid shipping” I assigned them to the relevant products. Products are separated into 2 packages. Your snippet is absolutely fine, but I wanted to highlight in this post is that you can easily separate packages on a per product basis. I used free shipping, but it could be any other shipping method. I have a query regarding adding forcefully shipping method product base. So below is my scenario. Shipping method set = Free shipping. 1. Free shipping should be disable if the product of other shipping method in cart. 2. I need to apply both rest of the shipping method to cart. => Flat rate for product Test1. So How can I achieve this using WooCommerce Hooks and filters. because currently all shipping method available in cart page so user can select any of the method. Can u edit code for Multivendors ? I have try to use this code in multivendors site, work enough good, calculate more shipping method. We sell coffee and merchandise online and have local cofee shops. One thing we sell on the site is pre-charged cards to be used in-store. When we sell these we don’t want to charge for shipping. They can be bought separately or in combination with other merch. Scenario 1: customer buys a coffee card only. We want to provide free shipping for this. Scenario 2: customer buys a coffee card + other merch. The other merch would have shipping charges, but we don’t want to add anything for the card. Scenario 3: customer buys other merch but no card. Normal shipping charges would apply. We use API shipping plugins for UPS and USPS. I see your comments say this will work but I’m not sure what I need to do differently for this. 3) I added the filter to functions.php, changing the slug to my slug in line 14. But when I add products to my cart, I’m not getting them broken out so I can’t independently select shopping options. And when I only have the card in the shopping cart, it’s giving me the other shipping options with charges, and I only want the free option (or free pickup) to be available. I am tried with your code but it is only working for cart, not for order details page or thank you page. 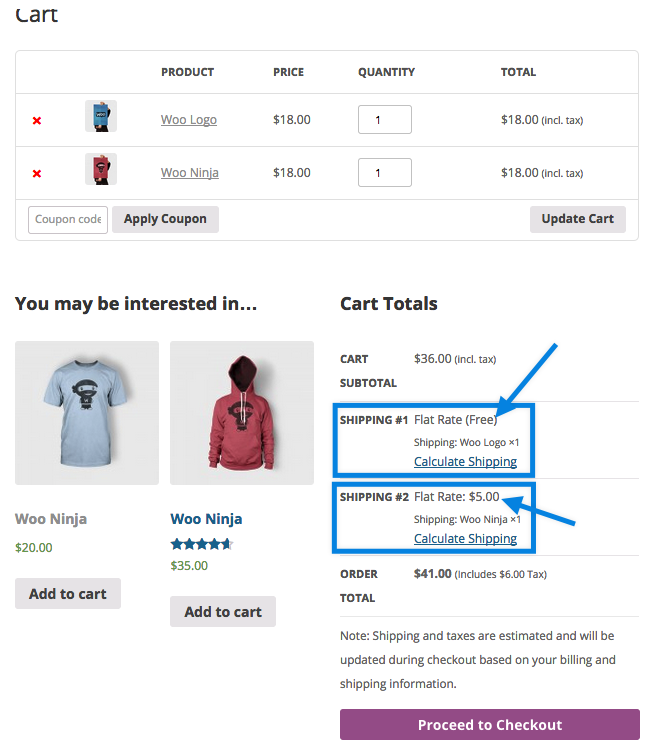 Is there any way we can display shipping cost on order details page or thank you page same as cart page? First of all, I appreciate you and your blog. You deserve a coffee!. You did a splendid job by writing this code. Convert this code to a plugin, it will be superb!